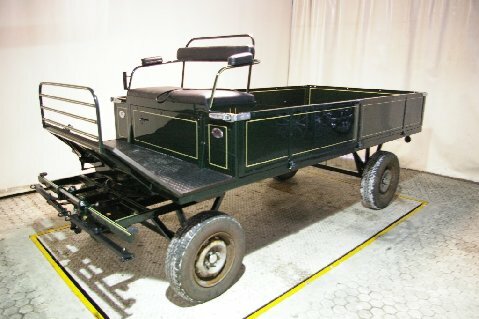 In addition to their range of carriages for pleasure, competition, and commercial purposes, Hartland Carriages also offer a very interesting and well priced range of vehicles for carrying out farm and yard work. Flat bed carriages can be supplied with or without sides, and also can be supplied as tippers too. They can tip with front or side lift facilities. Ideal for working in tight spaces when emptying…..The wheels on these carriages are either heavy duty steel with rubber carriage tyres, or heavy duty pneumatic, or solid pneumatic wheels. Brakes are usually disc brakes with hand brakes supplied as standard. Seating – they can have seats that accommodate up to 4 people on the front. Road reflectors are standard. On board rechargeable lighting is also a feature that can be included, as can revolving lights on poles at the back of the carriage which are increasingly popular for vehicle used on the roads. 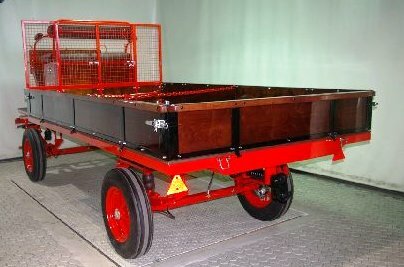 The farm and yard carriages are usually supplied with aluminium or painted panels but varnished wood is also an option. These carriages start at around £3950 and full details can be supplied direct from Hartland Carriages.